Station Wagon Review: Despite a huge drop in gas prices in late 2008, it looks like people have abandoned big SUVs en masse. Major auto manufacturers are hurting, and the U.S. companies are hoping for a Wall Street style bailout from Washington. 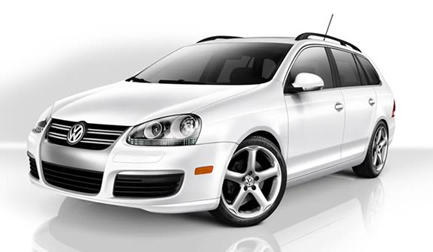 If you have good enough credit to actually buy a car, you might want to consider instead a small station wagon like the Volkswagen Jetta Sportwagen. You can haul five people or up to 66.9 feet of cargo with the rear seat folded but still earn up to 41 miles per gallon on the highway. The Jetta has been VW’s most popular vehicle in the U.S. for decades. Essentially a Golf / Rabbit with a trunk when it debuted long ago, it now has its own identity, offering German engineering and design for much less than an Audi, BMW, or Mercedes. All U.S.-bound Jettas are built in Puebla, Mexico. These cars feature beautifully designed and expertly assembled interiors, well above average materials, and a nice feel overall for the price. Even Consumer Reports recommends them now. Sportwagens are the same as their sedan brethren, except for the handsome extension at the rear. The new taillamps are surprisingly plain looking, but neatly integrated. Up front, the headlamps are, as in most new cars, elaborate and jewel like. Overall, the design is subdued, handsome and solid, perfect for happy day-to-day life, not meant for showing off. Driving the Sportwagen is easy and pleasant, with supportive seats and solid controls. It’s the kind of car you get used to quickly and settle into happily. I had one “Where’s Waldo” experience trying to find the AUX input jack but finally located it in a dark corner of the console bin, actually a good spot for it. My only other complaint is that the rear seats don’t fold completely flat, but the space back there is capacious. Sportwagens offer three engines, all through a manual or optional Tiptronic automatic transmission. The 2.5-liter inline five-cylinder delivers 170 horsepower and 177 lb.-ft. of torque, which is reasonable for a 3,200-pound car and moves you from zero to 60 mph in 8.4 seconds (manual) and 8.7 seconds (automatic). You can order up a 2.0-liter turbo four that puts out 200 horsepower and 207 lb.-ft. of torque and cuts the zero-to-60 time to 7.2 seconds (manual) or a speedy 6.9 seconds with the automatic. New this year is a 2.0-liter clean diesel with 140 horsepower and a mighty 236 lb.-ft. of torque. Zero to 60 takes 9.5 seconds, but reports say that the old diesel noise and odor issues are essentially banished. The EPA’s Green Vehicle Guide rates the 170-horsepower five-cylinder engine at 7 for both Air Pollution and Greenhouse Gas score. The PZEV engine version, available in California and several other states, earns 9.5 on the Air Pollution score. For reference, the diesel gets a 6 in Air Pollution but offers a solid 8 in the Greenhouse Gas score. Pick your car from four levels, the base S, SE, SEL, or diesel-equipped TDI. My Reflex Silver Metallic tester with Anthracite (coal black) interior was an SE, with the base 170-horsepower engine and the automatic (at an additional $1,100). The S comes with a fine assortment of equipment, including power windows, locks, and mirrors along with air conditioning, theft alarm, eight-speaker audio system with single CD slot, and a full serving of safety equipment. The SE adds V-Tex leatherette seats and door trim, chrome window trim, 16-inch alloy wheels, an upgraded audio system with CD changer, a rear center armrest and a window-mounted antenna. The SEL has the turbo engine as standard and bumps the alloy wheels to 17-inchers, automates the climate control system, adds a trip computer, provides rear seat passengers with a 115-volt outlet, powers the driver’s seat adjustments, and applies leather to the seats, steering wheel, shift knob, and handbrake. And, the manual transmission gains a gear. Fuel economy is 21 mpg City and 29 mpg Highway for both the naturally-aspirated and turbocharged engines with manual transmission. The Tiptronic with the turbo actually improves that mileage by one mpg on the City rating. Numbers for the TDI diesel are an excellent 30 City, 41 Highway. Base pricing starts at a dollar under $19,000 for the S, working up through $21,349 for the SE and $25,990 for the SEL. The TDI begins at $23,590. Add a $650 destination charge to all of these figures. My Sportwagen tester with the optional automatic transmission, 17-inch alloy wheels, premium audio system and cold weather package came to $24,099. There are still choices in the car market that won’t bankrupt you or take away your utility or fun and the 2009 VW Jetta Sportwagen is one of them.